Yuvraj Singh ( pronunciation ) (born 12 December 1981) is an Indian international cricketer. An all-rounder who bats left-handed in the middle order and bowls slow left-arm orthodox, Yuvraj is the son of former Indian fast bowler and Punjabi actor Yograj Singh. Yuvraj has been a member of the Indian cricket team in ODIs since October 2000 and played his first Test match in October 2003. He was the vice-captain of the Indian ODI team between 2007–2008. He was the Man of the Tournament in the 2011 ICC Cricket World Cup, and one of the top performers at the 2007 ICC World Twenty20, both of which India won. In a match against England at the 2007 World Twenty20, he famously hit six sixes in one over bowled by Stuart Broad — a feat performed only three times previously in any form of senior cricket, and never in an international match between two Test cricket teams. In the same match, he set the record for the fastest fifty in Twenty20 Internationals and in all Twenty20 cricket, reaching 50 runs in 12 balls. During the 2011 World Cup, he became the first player to take a 5-wicket haul and score a 50 in the same World Cup match. In 2011, Yuvraj was diagnosed with a cancerous tumor in his left lung and underwent chemotherapy treatment in Boston and Indianapolis. In March 2012, he was discharged from the hospital after completing the third and final cycle of chemotherapy and returned to India in April. He made his international comeback in a Twenty20 match in September against New Zealand shortly before the 2012 World Twenty20. Yuvraj was born in a Sikh family to Yograj Singh, a former India cricketer, and Shabnam Singh. Tennis and roller skating were Yuvraj's favorite sports during his childhood and he was quite good at both. He had also won the National Under-14 Roller Skating Championship. His father threw away the medal and told him to forget skating and concentrate on cricket. He would take Yuvraj to training every day. Yuvraj studied at the DAV Public School in Chandigarh. He also did two short roles as child star in Mehndi Sagna Di and Putt Sardara. After his parents divorced, Yuvraj chose to stay with his mother. On 12 November 2015, Yuvraj got engaged to Hazel Keech and married her on 30th November 2016. 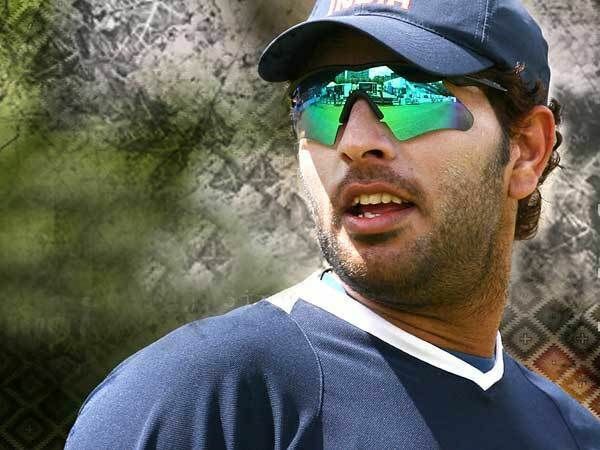 Yuvraj started his career from the Punjab Under-12s at the age of 11 years and 11 months in November of the 1995–96 season against Jammu and Kashmir-16s. 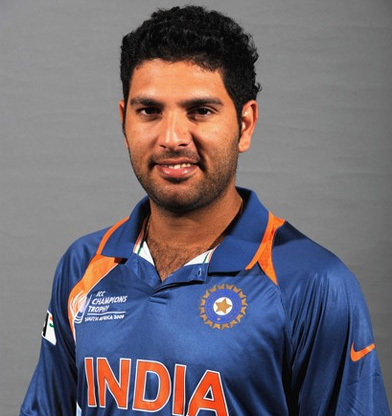 In 1996–97, Yuvraj was promoted to Punjab Under-19s and scored 137 not out against Himachal Pradesh Under-19s. Yuvraj made his first-class debut in late-1997 against Orissa during the 1997–98 Ranji Trophy but was dismissed for a duck opening the innings. His first breakout performance came in the Under-19 Cooch Behar Trophy Final of 1999 against Bihar at Jamshedpur; Bihar were all out with a score of 357 and Yuvraj batted at three for Punjab and made 358 runs himself. Yuvraj represented India in the series against Sri Lanka Under-19s in India in February 1999. 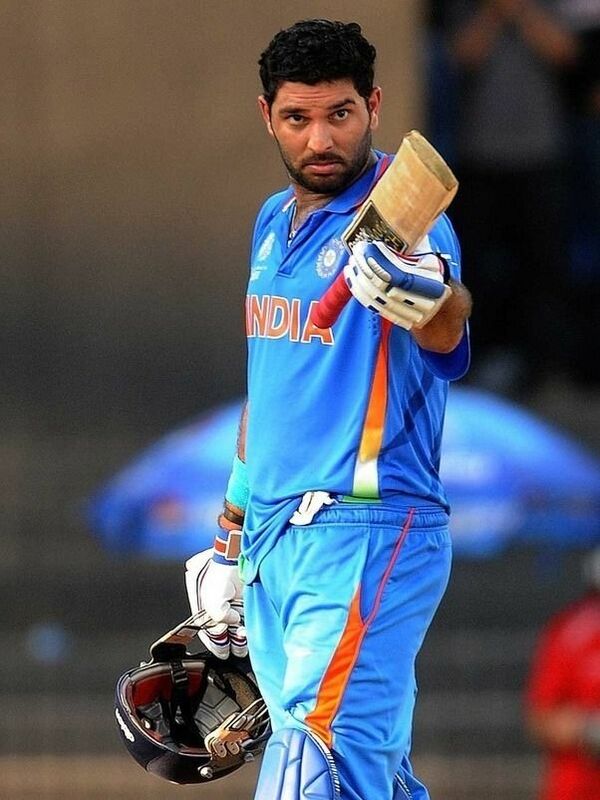 In the third ODI, Yuvraj scored 89 runs from 55 balls. In 1999-2000 Ranji Trophy, he scored 149 against Haryana. In the 2000 Under-19 Cricket World Cup which India won under the captaincy of Mohammad Kaif, Yuvraj's all-round performance earned him the Player of the Tournament award and a call-up to the national squad. His performance in the tournament included 68 off 62 and 4/36 against New Zealand in a group stage match, and a quickfire 58 off 25 balls against Australia in the semifinal. Yuvraj was subsequently selected in 2000 for the first intake of the National Cricket Academy in Bangalore. Yuvraj was selected in the Indian squad for the 2000 ICC KnockOut Trophy in the back of his impressive outings for the Under-19 team. He made his international debut against Kenya in the pre-quarterfinal. He bowled four overs conceding 16 runs but did not get to bat. In the quarterfinal match against Australia, Yuvraj won the man of the match for his innings of 84 (80), against a pace attack consisting of Glenn McGrath, Brett Lee and Jason Gillespie, that helped India win by 20 runs. In the semifinal against South Africa, he scored 41 and picked 1/15. He scored only 14 against New Zealand in the final which India lost. The tournament was followed by a tri-series involving India, Sri Lanka and Zimbabwe. Yuvraj scored just 55 runs in five innings at an average of 11. Yuvraj averaged 15.50 in the ODI series against the touring Zimbabwe side in December 2000 after which he was dropped from the team. Yuvraj made his comeback during the 2001 Coca-Cola Cup in Sri Lanka. He scored a crucial 98* against Sri Lanka in the fifth match in an otherwise disappointing series with the bat. However, he proved to be useful with the ball as he took 8 wickets at an average of 27. In the Standard Bank triangular series involving hosts South Africa, India and Kenya, Yuvraj managed to score only 69 runs from 6 innings, including a duck in the final against South Africa. Following this, Dinesh Mongia and Hemang Badani were chosen over Yuvraj in the squad for the home series against England in January 2002. Yuvraj returned to playing domestic cricket in early 2002. After a very disappointing run in the Ranji knockouts, Yuvraj struck 209 for North Zone against South Zone in a Duleep Trophy match in March 2002. He was immediately drafted into the national squad for the final two ODIs against Zimbabwe with India trailing the series 1–2. Yuvraj made an impact in his return match at Hyderabad, scoring an unbeaten 80 off just 60 balls, to take India to a five-wicket win and level the series. He won the Man of the Match award for his efforts. In the final ODI at Guwahati, Yuvraj made 75 runs from 52 balls, sharing a 157-run fifth-wicket partnership with Mongia who scored his career-best unbeaten 159, to help India post a total of 333 in their 50 overs. India went on to win the game by 101 runs and the series 3–2. After winning the ODI series in the West Indies 2–1, where Yuvraj managed scores of 1 and 10, the Indian team toured England in June for the NatWest triangular series and a four-match Test series against the hosts. The NatWest Series featured teams from England and Sri Lanka, apart from India. In the first match at Lord's, Yuvraj won the man of the match for his all-round performance (3/39 and 64*) as India successfully chased down England's total of 271. In the next match against Sri Lanka, he scored 31 and shared a crucial 60-run sixth-wicket partnership with Mohammad Kaif to set up another successful run-chase. 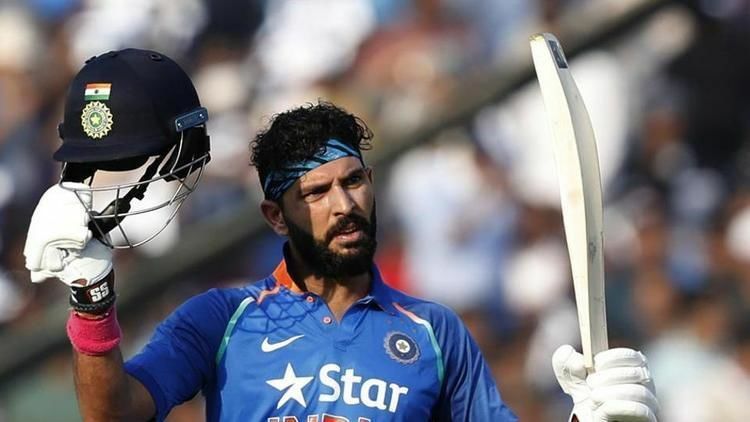 India's next match against England was washed out due to rain after Yuvraj had scored an unbeaten 40 off 19 balls to take India to 285/4 in their 50 overs. Yuvraj's knock of 37, along with a fifty from Rahul Dravid, helped India recover from 59/4 to reach the target of 188 against Sri Lanka. This win eliminated Sri Lanka from the series with another round of matches still to be played. Yuvraj had scores of 5 and 8 in the final round of matches but proved to be useful with the ball as he picked one wicket in each of the two games. At the end of the round-robin matches, India topped the points table with 19 points while England finished second with 15 points. The final was played at Lord's on 13 July between India and England. After winning the toss and electing to bat first, England posted a daunting total of 325/5 in 50 overs. In reply, India was struggling at 146/5 at the end of 24 overs, when Kaif joined Yuvraj at the crease. The pair initially stabilised the innings and later scored at a brisk rate. The duo shared a partnership of 121 runs for the sixth wicket which came to an end when Yuvraj was dismissed for 69 (63 balls) as he top-edged a sweep shot in the 42nd over off the bowling of Paul Collingwood resulting in a simple catch to Alex Tudor at short fine leg. India went on to win the game by two wickets with three balls to spare. This was India's first win in the final of an ODI tournament since 2000, after nine consecutive defeats. This win is regarded as one of India's greatest victories in ODI cricket. Yuvraj batted in two games of the 2002 ICC Champions Trophy which was held in Sri Lanka in September. He scored 3 against Zimbabwe in the opening match, and 62 in the semifinal against South Africa. In November 2002, Yuvraj struggled in the first five games of the 7-match ODI series against West Indies, with a high score of 30. He returned to form in the sixth ODI at Jodhpur with a half-century that helped India win the match by three wickets and level the series 3–3. He top-scored for India in the 7th match with a 69-ball 68, but could not get support from any other batsman. India crashed to a 135-run defeat and lost the series. He struggled for runs in the seven-match ODI series in New Zealand in December 2002 – January 2003, averaging just above 19 with a solitary fifty. Despite his indifferent form leading to the World Cup, Yuvraj secured a place in the 15-man Indian squad for the 2003 ICC Cricket World Cup in South Africa. He scored 37 in India's opening match against Netherlands. In the following games, he had scores of 0, 1 and 7* against Australia, Zimbabwe and Namibia respectively. He scored a brisk 42 against England, followed by an unbeaten 50 against Pakistan setting up wins for India in both games. In the Super Six stage of the tournament, Yuvraj had scores of 58* against Kenya and 5 against Sri Lanka. He scored 16 in the semifinal against Kenya, and 24 against Australia in the final. 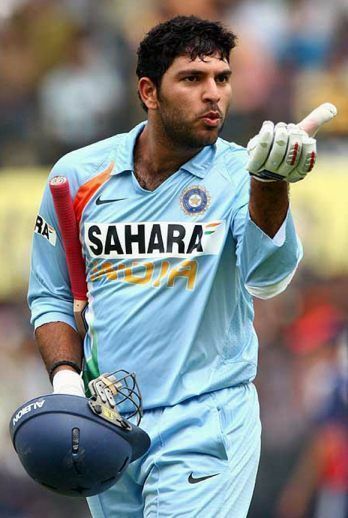 Yuvraj scored his maiden ODI century (102* from 85 balls) against Bangladesh at Dhaka on 11 April 2003. In May 2003, Yuvraj was signed-up by the Yorkshire County Cricket Club for the 2003 county season. He became only the second Indian after Sachin Tendulkar to represent the county. Yuvraj's Test debut came on 16 October 2003 at his home ground Mohali against New Zealand. Batting at six, he scored 20 in the first innings, and 5* in the second innings. In the TVS Cup tri-series in October–November 2003 involving India, Australia and New Zealand, he scored 113 runs from 7 games at an average of 18.83 and top-score of 44. Yuvraj returned to form in early-2004 in the tri-series involving Australia and Zimbabwe. He scored 314 runs from 8 innings at an average of 39.25, including his second ODI hundred – 139 runs from 122 balls, with 16 fours and two sixes – against Australia at the Sydney Cricket Ground. He had a mixed tour of Pakistan in March–April 2004. He disappointed in the ODI series with 141 runs from 5 matches, averaging just over 28, but found success in the Test series. In the first Test at Multan, he scored 59 – his maiden Test fifty – as India registered an innings win. He also picked his maiden Test wicket during the second innings of Pakistan. In the second Test at Lahore, Yuvraj scored his maiden Test century during India's first innings while the rest of the batting lineup struggled against the bowling of Umar Gul. Yuvraj's innings of 112 came from 129 deliveries with 15 fours and two sixes. He made only 12 runs in the second innings and Pakistan leveled the series by winning the match by 9 wickets. He scored 47 in the final Test at Rawalpindi where India secured the series with another innings victory. However, he lost his form in the latter half of 2004 with batting averages of 31 in the 2004 Asia Cup, 12.33 in the Natwest Series in England and 4.50 in the 2004 ICC Champions Trophy. In October 2004, after the first two Tests of the Border-Gavaskar Trophy, he was dropped from the Test squad as his dismal run with the bat yielded just 47 runs from the two matches. Despite the dip in form towards the end of 2004, Yuvraj continued to be a regular feature in the Indian ODI team. In the Platinum Jubilee Match against Pakistan in November 2004, he scored a 62-ball 78 in a losing cause. In December 2004, Yuvraj scored 94 runs at an average of 31.33 in the three-match ODI tour of Bangladesh including a quickfire knock of 69 from 32 balls in the final ODI at Dhaka. He had a disappointing ODI series at home against Pakistan in April 2005, scoring 98 runs in six matches at 19.60. In July–August 2004 Yuvraj was the leading run-getter for India in the 2005 Indian Oil Cup triangular series in Sri Lanka also involving the hosts Sri Lanka and West Indies. He scored 192 runs in four matches, averaging 48. He also recorded his third ODI century during the series – 110 runs from 114 balls (11 fours and one six) – against West Indies at Colombo for which he was awarded the man of the match. Yuvraj then played in the Videocon Cup in August–September 2005, a triangular series involving India, New Zealand and the hosts Zimbabwe. He averaged 54 with the bat in the series, scoring 216 runs from 5 matches. His innings of 120, in the final round-robin match against Zimbabwe at Harare, helped India recover from a precarious position of 36/4 and successfully chase down the target of 251. It was his fourth ODI hundred and he won the man of the match award for his efforts. In the two-match Test tour of Zimbabwe that followed the tri-series in September, Yuvraj had scores of 12 and 25. In October–November 2005, Yuvraj had a quiet seven-match ODI series at home against Sri Lanka. He managed just 124 runs in six innings at an average of 31 with a top-score of 79*. In November 2005, Yuvraj scored 103 in the first ODI against South Africa at Hyderabad to take India from 35/5 to a respectable total of 249/9, and won the man of the match award although South Africa won the game by five wickets. He picked 1/17 and scored the winning runs in the second ODI at Bangalore, before the third match at Chennai was washed out due to rain. He scored 53 and 49 in the final two matches at Delhi and Ahmedabad respectively, and the series was drawn 2–2. Yuvraj and South African captain Graeme Smith were jointly awarded the man of the series as each of them scored 209 runs at 69.66, finishing as joint-highest run-getters of the series. Yuvraj had a mixed home Test series against Sri Lanka in December 2005 as he registered two ducks and two half-centuries. He scored 0 & 77* in the second Test at Delhi, and 0 & 75 in the third Test at Ahmedabad as India won both the matches by comfortable margins. Yuvraj was picked in both Test and ODI squads for the Pakistan tour in January–February 2006. The first two Tests were drawn in which he batted only once, in the second Test, scoring 4. In the third Test at Karachi, he top-scored for India in both innings. After scoring 45 in the first innings, he went to score his second Test hundred in the second innings (122 runs from 144 balls). India lost the match by 341 runs and the series 1–0. In the one-day series, he continued to be in sublime form. He scored a 28-ball 39 in the first ODI at Peshawar which Pakistan won by 7 runs by Duckworth–Lewis method. He scored an unbeaten 82 in the second match at Rawalpindi taking India to an emphatic 7-wicket win, before scoring an unbeaten 79 in the third game at Lahore and helping India successfully chase the target of 289. In the low-scoring fourth match at Multan, he scored 37 as India took the series with a five-wicket victory. In the fifth and the final ODI at Karachi, Yuvraj, batting at three, hit his sixth ODI century. His innings of 107* which came off 93 balls with 13 boundaries helped India comfortably chase down the target of 287 for the loss of only two wickets. He won the man of the match award for this innings and was also adjudged player of the series. Against England, Yuvraj averaged 21.33 in two Tests in March but proved to be successful with both bat and ball in the ODI series in which he again won the player of the series award. During the series, he won the back-to-back man of the match awards in the third and fourth ODIs. In the third match, he made 103 from 76 balls, and in the fourth match, he picked 2/34 and scored 48. He scored a total of 237 runs in the series at an average of 47.40 and took 6 wickets with his part-time bowling. On India's tour of the West Indies, Yuvraj hit two fifties in the ODI series. In the second ODI at Kingston, with India needing two runs to win with one wicket in hand and three balls to spare, Yuvraj was bowled by Dwayne Bravo for 93. India went on to lose the series 4–1. His poor run of form in Tests continued, with him scoring 104 runs from four matches at an average of 17.33 and a top-score of 39. In September 2006, Yuvraj was dropped from the playing eleven during the 2006-07 DLF Cup in Kuala Lumpur after he registered two consecutive ducks against Australia and West Indies. He played in two group matches of the 2006 ICC Champions Trophy held in India in October. and scored 27* against England and 27 against West Indies. During a training session before India's final group fixture against Australia, Yuvraj suffered a ligament injury in his left knee. Mongia replaced him for the match which India lost to crash out of the tournament. In November, Indian team physio Andrew Leipus suggested that Yuvraj is unlikely to recover from the injury before the start of the World Cup in March 2007. Yuvraj was not named in any of the Indian squads that toured South Africa in late 2006. In January 2007, less than two months before the World Cup, he made a comeback from injury for the last two matches of the four-match ODI series against West Indies, but did not make much of an impact in either game. Despite concerns over his fitness, Yuvraj was selected in the 15-man Indian squad for the 2007 Cricket World Cup, with the chairman of selectors Dilip Vengsarkar confirming Yuvraj was fit. He featured in the last two matches of the four-ODI series against Sri Lanka in February 2007, and struck an unbeaten 83-ball 95 in the deciding final game at Visakhapatnam. India won the match by seven wickets and the series 2–1. Yuvraj made 47 in India's first match of the World Cup, a shock defeat to Bangladesh. In India's next group match at Port-of-Spain against World Cup debutants Bermuda, he hit 83 off 46 balls to help India post a total of 413/5, the highest World Cup total. After the big win against Bermuda, India were left with a must-win final group fixture against Sri Lanka. Chasing 255 to win the match, Yuvraj was dismissed run out for 6, as India were bowled out for 185 and made an early exit from the World Cup. In the three-match ODI series against South Africa in Ireland, Yuvraj took 3 for 36 and scored an unbeaten 49 in the second ODI before winning man of the match for his unbeaten 61 in the series-deciding final game. On India's tour of England, Yuvraj remained on the bench throughout the Test series before finishing third on the run-scorers list in the ODI series with 283 runs from 7 matches at an average of 40.42. Yuvraj missed the next game against South Africa due to a niggle but recovered before the semifinal against Australia. In the semifinal, he top-scored with 70 off 30 balls and also hit the longest six of the tournament (119 metres (390 ft) off the bowling of Brett Lee). India won the match while Yuvraj was awarded another man of the match award. He was dismissed for 14 in the final against Pakistan as India went on to win by five runs and lift the trophy. All players of the victorious Indian team were given cash reward of ₹80 lakh by the BCCI while Yuvraj was rewarded with an additional ₹1 crore as well as a Porsche 911 by the BCCI vice president Lalit Modi. In September 2007, Mahendra Singh Dhoni and Yuvraj were named ODI captain and vice-captain respectively, following the resignation of Rahul Dravid. Yuvraj scored 121 at Hyderabad in a losing cause in the third of the seven ODIs against Australia, but accumulated only 71 in the other six matches of the series. He enjoyed a return to form in India's home ODI series against Pakistan in November 2007. He scored four half-centuries in five matches, averaging 68, and was named player of the series as India won the series 3–2. He was also fined for showing dissent in the final match in Jaipur. Although Yuvraj was included in Indian squad for the subsequent Test series against Pakistan, Test captain Anil Kumble said that Yuvraj "will have to wait a little bit more to become a regular member in the Test squad." He did not feature in the playing eleven in the first two matches, but was picked in the third Test at Bangalore to replace an injured Sachin Tendulkar. Batting first, India was 61/4 before Yuvraj and Sourav Ganguly shared a 300-run fifth-wicket partnership, and Yuvraj recorded his highest Test score of 169 off 203 balls and Ganguly went on to score 239 which was his highest score in tests. He had a very poor Test series against Australia in Indian tour to that country in 2007/08. After his poor showing in the first two Tests, he was dropped for the remainder of the series. In November 2008, he hit 138 not out from 78 balls against England at Rajkot, taking 64 balls to reach his century which at the time was the second fastest by an Indian in ODIs after Mohammad Azharuddin's century in 1988 against New Zealand came off 62 balls. After reaching 50 from 42 balls, he added a further 88 in the next 36 balls. He did so despite straining his back, which necessitated the use of Gautam Gambhir as a runner. This was followed by 118 from 122 balls and a 4/28 all his wickets being specialist batsmen in the next match in Indore, earning him two consecutive man of the match awards. Yuvraj scored 85 not output on an unbroken partnership of 163 with Sachin Tendulkar to defeat England in the First Test at Chennai in December 2008. It was the fourth highest successful run chase in history and the highest in India. He scored a quick, unbeaten 54 in the second innings of the Napier Test against New Zealand to help India save the game after following on. India preserved their lead and went on to win the series 1–0. Yuvraj was dropped from the Asia Cup following the team's return from the World Twenty20 in West Indies. Lack of form and fitness issues were talked of as the reasons for his exclusion, but he made a return for the series against Sri Lanka. With Suresh Raina scoring a century on Test debut and Cheteshwar Pujara making a compelling case for higher honors with his consistent first-class performances, Yuvraj was dropped from the Test squad for the two-match series against Australia. In October 2010, Yuvraj Singh won the Irani Cup as the Captain of the Rest of India team and scored 204 not out. Yuvraj had a dream run at the 2011 ICC Cricket World Cup, where he scored 362 runs including one century and four fifties, took 15 wickets, won four Man-of-the-Match awards and was also awarded the Player of the Tournament. In the process, he became the first allrounder to score 300-plus runs and take 15 wickets in a single World Cup. In India's match against Ireland in the same tournament, he became the first player to take 5 Wickets and score 50 runs in a World Cup match. He took his 100th ODI wicket, with the dismissal of Wesley Barresi in the 2011 World Cup match against the Netherlands. In the 2011 World Cup till he took charge of the chase against defending champions Australia. In recent years, he has added value to the side through his improved off spin bowling. In the ICC World Cup 2011, he won four Man of the Match awards, which is joint best with Sri Lanka's Aravinda de Silva in 1996 and South Africa's Lance Klusener in 1999. Yuvraj had respiratory difficulties through 2011 and in May he withdrew from the ODI series in the West Indies due to an illness. He toured England but had to return home after breaking his finger in the Nottingham Test and later played two home Tests against West Indies. However, he then pulled out of the ODI series against West Indies in November citing an abnormal tumor in his lung. Yuvraj had originally targeted the CB series in Australia for his return to international cricket. His issues began with breathing difficulties, nausea and bouts of vomiting blood before India's successful run through the 2011 World Cup, which he ended as the player of the tournament. Post ICC World Cup he was diagnosed with a cancerous tumor stage-1 in his left lung and underwent chemotherapy treatment at the Cancer Research Institute in Boston, United States as well as the Indiana University Melvin & Bren Simon Cancer Center in Indianapolis, Indiana where he was cared for by famed oncologist Dr. Lawrence Einhorn. His mother Shabnam Singh was with him during his diagnosis in the USA. In March 2012, Yuvraj was discharged from hospital after completing the third and final cycle of chemotherapy and returned to India in April. After his chemotherapy sessions treating seminoma in Indianapolis, Yuvraj's cancer showing full signs of remission, he aimed at resuming cricket at the World Twenty20. The selectors picked Yuvraj Singh to be a part of the 15-member Indian squad for the World Twenty20 in Sri Lanka in September 2012. He played against New Zealand in a T20I at Chennai where he scored 34 off 26 balls (1 four, 2 sixes) as his side lost by only 1 run. He started his World Twenty20 campaign with a 3/24 against Afghanistan. He took 1/16 against Australia, 2/16 against Pakistan and a 2/23 against South Africa. He ended up being the highest wicket taker for India in the tournament though he could not match up to the expectations with his bat. He got selected for the Test series against England at home, and while preparing for test, he played a single Duleep Trophy match against Central Zone at Hyderabad where he scored 208 off 241 balls (33 fours and 3 sixes) before being caught and bowled by Murali Kartik. Then he also starred in a first-class match against England as a member of India A cricket team, where he scored 59 (7 fours and 4 sixes) and took 5/94 at Brabourne Stadium in Mumbai. He later played 3 test matches in the 4 match test series against England after which he was dropped. He later was selected for the India-Pakistan Series in the second T20 he came back to form by scoring a blistering 72 off just 36 balls. He could not make an impact in the One Day series against Pakistan and England only scoring 1 half century in 7 matches. He did not have a very good IPL troubled by a back injury and bad form he was dropped from the squad for the Champions Trophy and Zimbabwe series. He made a come back through India A against West Indies A series scoring 123 off just 89 balls in the first ODI followed by 40 off 58 balls and 61 off 59 balls. In September 2013, Yuvraj made a comeback to India's limited-overs squad for the Twenty20 and first three ODIs of the home series against Australia. However, following a fitness programme in France, he has shown a return to top form in List A cricket. He was the leading run-getter for India A in the limited-overs series against the touring West Indies A, with 224 runs from three matches, including one hundred and a fifty at an average of 74.66. He also scored a half-century for India Blue in the Challenger Trophy, a domestic 50-overs tournament. In October 2013, Yuvraj scored 77 off 35 showed his dominance in the only T20I against Australia at Saurashtra Cricket Association Stadium in Rajkot. India was facing an asking-rate of nearly 12 at 100 for 4 in the 12th over but Yuvraj's response was so forceful that all Dhoni needed to do was give him the strike. By the end, the partnership was 102 at exactly two runs a ball. But Yuvraj had a woeful home ODI series against Australia in October, scoring 19 runs in four innings, when he was visibly troubled by the pace of Mitchell Johnson. He couldn't bat himself back into form in the home ODIs against West Indies or on the South Africa tour and was expected to be dropped for the New Zealand tour given the conditions in that country and the hosts' pace-heavy attack. In February 2014, Yuvraj was bought by the Royal Challengers Bangalore for 14 crores. Kingfisher Airlines employee union sent a letter to Yuvraj. It requests him not to play for Royal Challengers Bangalore. He was not selected for Asia Cup 2014 in Bangladesh but he selected for the World T20 same place. Yuvraj performances in the practice matches were major boosts for India ahead of the World T20. In Super10 match against he missed a full delivery and was bowled by the second ball. In both matches, he put down what could have been costly misses Chris Gayle and Mohammad Hafeez but India created and converted more chances soon after. His solitary over in the tournament so far went for 13. Yuvraj Singh scored 60 of 43 balls is his third fifty against Australia at Mirpur and his eighth in T20Is. Yuvraj has gone past Gautam Gambhir to become the top run-scorer for India in T20 internationals. He had an 84-run partnership with Mahendra Singh Dhoni is India's third-highest for the fifth wicket. India's highest partnership for the fifth wicket came in their last match against the same opposition when Yuvraj and Dhoni added 102 while chasing 202 in Rajkot. On 5 July 2014, he played for the Rest of the World XI against Marylebone Cricket Club (MCC) in the Bicentenary Celebration match at Lord's, as he had been left out of India's ODI team. Under Shane Warne's captaincy, he struck almost a-run-a-ball century to rescue his team who had been struggling at 59 for 3. His 100 came up as he hit Sachin Tendulkar for a boundary. Rest of the World finished on 293 for 7 after 50 overs, but MCC went on to win the match by 7 wickets. Notably, Singh was one of the five senior players who were not considered for the 2015 World Cup and was not included in India's 30-man probable for the tournament. At the 2014–15 Ranji Trophy that followed the selection, Singh scored three centuries and finished with 671 runs in 7 matches with an average of 55.91. In September 2015, Yuvraj was named Vice-Captain of the Punjab Cricket Team. Singh was picked in India's T20I squad for the January 2016 Australia tour on the back of strong performances in Vijay Hazare Trophy, where he was the third-highest run-getter with 341 runs at an average of 85.25. He finished the three-match series with 15 runs after getting to bat in just one inning, and two wickets. He was not named in the T20I squad for the tour of West Indies in August. Meanwhile, he was named captain of the India Red side for the 2016–17 Duleep Trophy. His team lost to India Blue in the final. Singh was picked in India's ODI squad for the home series against England in January 2017. This came on the back of his fine performances in the Ranji Trophy, having scored 672 runs in five games for Punjab, which included a 260 against Baroda. In the second match of the series, he scored his career best score 150, which came off 127 balls, a knock that included 21 fours and three sixes. He put on 256 runs for the fourth wicket along with Dhoni and helped the team post a total of 381. Following the team's 15-run victory, he was named the Player of the Match. Following the match, Singh revealed that he had thought of quitting after having been dropped from the team. He said, "When I came back from cancer it was hard work. I was not performing and after being dropped I thought (about) whether I wanted to continue or not." Yuvraj is primarily a left-handed batsman but can bowl part-time left-arm orthodox spin, which he improved in the latter part of his career. He is regarded as a better batsman against fast bowling than spin bowling, and cites the Indian Oil Cup 2005 as a turning point in his career. Yuvraj is one of the athletic fielders in the Indian team, fielding primarily at point & covers with a good aim at the stumps. Yuvraj is a natural stroke player with an aggressive style of play, as seen by his strike rate of above 150 in T20 internationals & just below 90 in ODIs. Many regard him as one of the best clean strikers of the ball, with his trademark punch through the covers a treat to watch. When in good touch, he can clear the ropes quite effortlessly. A Cricinfo report published in late 2005 showed that since 1999, he was the fourth most prolific fielder in affecting ODI run outs, and of those on the list of prolific fielders, he had the second highest rate of effecting a run out. He was previously often characterised as having attitude problems, but later often assumed leadership positions during Rahul Dravid's tenure as captain. His favourite cricketing shot is pull shot. His others well known shots include flick, cover drive and cut shot. He was the icon player and captain for Indian Premier League (IPL) team Kings XI Punjab in the first two seasons; in 2010, the third season, icon player status was abolished and the captaincy given to Kumar Sangakkara. They came second in the round-robin phase of the tournament, but lost their semi-final to the Chennai Super Kings. On 1 May 2009, Yuvraj registered his first hat-trick in T20 cricket against Royal Challengers Bangalore at Kingsmead in Durban, the same ground where he hit his six sixes. He dismissed Robin Uthappa, Mark Boucher and Jacques Kallis. On 17 May 2009, Yuvraj took his second Twenty20 hat-trick against Deccan Chargers at the Wanderers Stadium in Johannesburg. Yuvraj dismissed Herschelle Gibbs, Andrew Symonds and Venugopal Rao. The Pune Warriors were a new team introduced for the 2011 IPL. Yuvraj Singh was bought by the team and chosen as captain. Pune Warriors finished ninth, ahead of only the Delhi Daredevils. From 14 matches, Yuvraj scored 343 runs at an average of 34.30, including two half-centuries. After much controversy BCCI had allowed Pune Warriors to have his replacement for 2012 Indian Premier League, citing his medical condition and nonavailability for 2012 IPL due to the same. In 2014, Yuvraj was bought by the Royal Challengers Bangalore for 14 crore. Kingfisher employee union sent a letter to Yuvraj requesting him not to play for Royal Challengers Bangalore. In 2015, he was bought by Delhi Daredevils for a mammoth Rs. 16 Crores In the 2016 IPL auction he was bought by Sunrisers Hyderabad for Rs. 7 crores. In 2016, he had a very successful IPL campaign with the Sunrisers Hyderabad after winning the 2016 Indian Premier League, he also put a strong performance in the final after scoring 38 runs from 23 balls. In a 2007 ICC World Twenty20 match, he hit six sixes in a single over. He became the first all-rounder to 300 plus runs and to take 15 wickets in a single World Cup. He was the Man of the Tournament in the ICC Cricket World Cup 2011. He was awarded with the Arjuna Award (India's second highest, Sporting Award) in 2012 by the President of India. In 2014, he was awarded with the Padma Shri Award. In February 2014, he was honored with FICCI Most Inspiring Sportsperson of the Year Award. Yuvraj was signed by Microsoft to be a brand ambassador for the Xbox 360 video game console when it was launched in India in 2006. He appeared in advertisements for the console alongside Bollywood actor Akshay Kumar. Codemasters' cricket video game Brian Lara International Cricket 2007 was released with his endorsement in India, titled "Yuvraj Singh International Cricket 2007". The Bollywood animated film, Jumbo features cricketer Yuvraj Singh's voice therefore starting his career in Bollywood. The upcoming animated full-length feature film Captain India features Yuvraj Singh as the main protagonist. Yuvraj has also been involved in sports based e-commerce; he is a brand ambassador of sports365.in, an online store focused on selling sports goods and fitness equipment. Yuvraj is also the brand ambassador for the sports brand Puma. He was appointed as the brand ambassador of Ulysse Nardin watch in 2013. Yuvraj's charity YouWeCan has treated over hundreds of cancer patients. In April 2015, he announced the intention to invest INR 40–50 crores in online startups, expanding the YouWeCan proposition by setting up YouWeCan Ventures in order to do so. Yuvraj Singh also participated in the ‘Celebrity Clásico 2016′ which was played with an objective to generate funds for charitable initiatives. The Test of My Life : From Cricket to Cancer and Back.